1.I am happy to be amidst a group of academicians representing some of the best educational institutions in India and Russia. In the present-day knowledge societies, where innovation is at the core of growth, progress and prosperity, educational and research institutions play a critical role. Each of your institutions is a key participant in the national development of India and Russia. 2.Russia’s educational institutions have a great legacy of accomplishment. As far back as 1930, during his visit to the Soviet Union, Rabindranath Tagore had described your universities as "miracles in the realm of education”. It is this educational system that has led to Russia’s enviable success as a nation of learning. It has enabled Russia’s technological achievements in areas such as material sciences, aerospace, nuclear science, petrochemicals, mining and heavy engineering. 3.This hallowed institution where we stand now – the Moscow State University – has produced 17 Nobel Prize and Fields Medal laureates in the last sixty years. 4.India today seeks to accelerate her economic growth and development through a strong emphasis on technology and innovation. Our educational and research institutions are making vigorous efforts to rise to these ambitious national goals and the aspirations of our people. This includes a significant expansion in the reach of quality education, up-scaling our research capacities, and linking more closely research output to industrial needs. 5.Research is the cornerstone of academic endeavour. Its quality determines the academic calibre of an educational institution. Indeed, without strong research programmes, no institution of higher education can truly accomplish its central mandate of promoting learning and knowledge. It is, thus, imperative that all educational institutions place research at the core of their future plans and activities. 6.India and Russia have benefited from bilateral programmes of scientific cooperation. These include our Integrated Long Term Programme dating back to 1987, the establishment of joint centres of excellence as well as mutual research support programmes. In recent years, India and Russia have launched new cooperation programmes in areas such as basic sciences and health research. I am glad that our Department of Science & Technology and Russian Science Foundation have finalized a cooperation agreement which will offer another platform for supporting joint research projects. 7.India and Russia have a long history of educational cooperation. In the late 1950s, the Soviet Union supported the Indian Institute of Technology, Bombay in its formative years. Tens of thousands of Indian students studied in Russia in the 1970s, 80s and 90s. Though the numbers have dropped somewhat in recent years, even now, over four thousand Indian students study at Russian universities. Some of our institutions have active programmes of cooperation - exchange of students, researchers and faculty members, and sharing of research publications. 8.Notwithstanding this, there is a need for a broader and institutionalized engagement between our educational institutions. 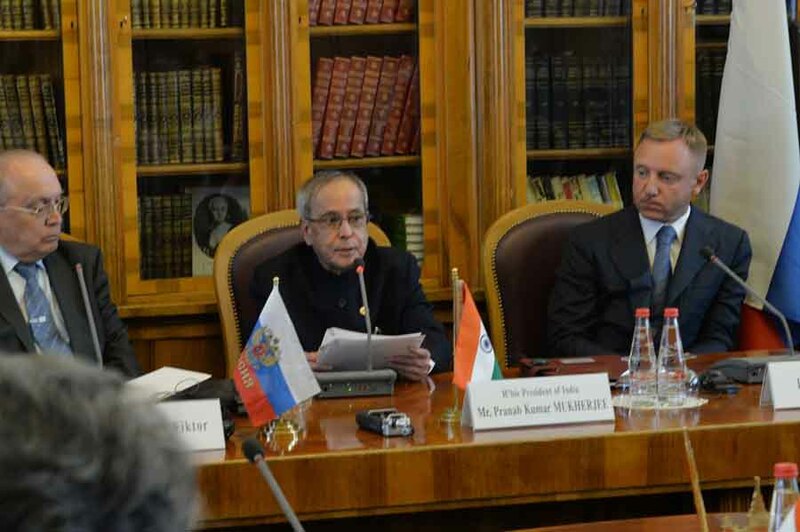 At the last Summit meeting between India and Russia in December 2014, the two countries had decided to support a network of partnerships between our universities. I am glad that over recent months, many of you have been involved with your counterparts in identifying opportunities for cooperation and are ready to formalize arrangements for systematic cooperation in the future. 9.The establishment of a Network of Indian and Russian Universities would facilitate establishment of more institutional linkages, including exchanges of faculty, researchers and students, joint research activities and scientific conferences and symposia. I extend my best wishes for fruitful cooperation in the Network.